At any time, you can switch your meal plan. You also have options to add a breakfast and lunch meal plan, but I have found there's enough food left over that we do not need to add those to the subscription. I have made meals from the clean eating, paleo, natural & organic, and vegetarian meal plans and have been pleased with each. This coming Sunday is not only Father's Day, but it's also Drew's birthday. 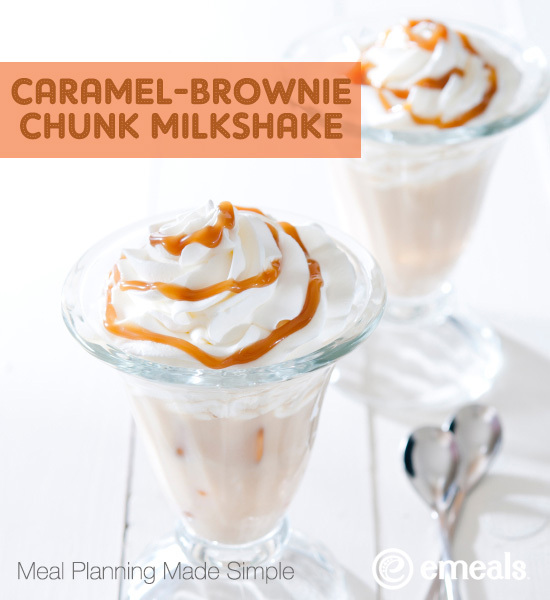 He loves eating ice cream, so I was excited to see the Father's Day dessert recipe for Caramel-Brownie Chunk Milkshake. I made this last night as an early birthday treat and was able to put it together in five minutes. I made a few moderations, using cookies and cream ice cream and cookies. Drew stated, "This is very good." 1. Place milk in a blender. 2. Add ice cream; blend until smooth. 3. Add half of brownies to blender and pulse until blended. 4. Spoon into glasses, drizzle with desired topping. 5. Top milkshakes with leftover brownie bits. Right now if you sign up for eMeals, you can save 15% off the cost with the discount code DADS. I was given a complementary year long eMeals subscription in return for blogging about eMeals.